My circumstances this month were especially happy. 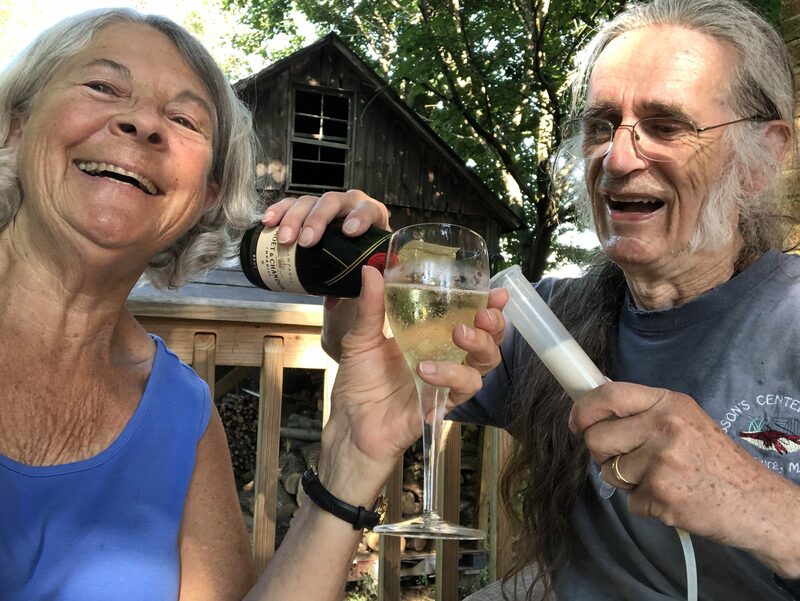 On July 3rd Felicity and I shared champagne to celebrate our 53rd wedding anniversary. A week later I went for three weeks of Buddhist teachings and practice with my so wise, kind, clear, practical and funny teacher. A dear friend’s question at the retreat about how my Buddhist practice helped me to attain a measure of equanimity led me to reflect on what led me to this path. The Tibetan aspect was sparked fifty years ago when my aunt Madge gave me “Seven Years in Tibet” for my birthday. It told me nothing about Buddhism but it left me longing to go to Tibet. What led me to Tibetan Buddhist practice is more complex. To explain that I must say a bit about some life experiences and their results. Until I was five we lived in a tiny and very remote house with no utilities at all and we were very happy. Then we moved so I could go to school. My parents needed more money to live in that place and they never had enough after that. Watching them, I developed a great fear of poverty. In High School I tried to figure out what to do with my life. It seemed the most important thing would be to attain wisdom. I’ll explain why in a minute. I read about Zen Buddhism, Sufi and Christian mystics, I read existential philosophers, Gurdjeff and Ouspensky, Jung, Aldous Huxley’s experiments with LSD, and so much more. But I could not figure out how to start and in any case it seemed impractical. My greatest emotional need was to escape from poverty and I thought the way to do that was to amass money. So I got a job picking apples, then one in an office when all the apples were picked, and there I stumbled upon computers. By the time I was 35 I was leading a data communication business with a staff of 100+ that contributed a third of the profits reported by the larger business of which it was part. Then we were acquired by a much larger business. My operation was inconsistent with their strategy so it was shut down. I was devastated. It did not occur to me that my response to that event was creating the suffering I inflicted on myself, my family and others, not the event itself. I had constructed an imaginary future that would among other things end my fear of poverty, and I was fiercely attached to that dream. It had come to an end but I could not let it go. Not understanding that I was the creator of my own suffering, after many months I changed my circumstances. I started a consulting business that would have multiple clients, not be vulnerable to changes at just one. Effective as that was, it did nothing for the root problem. Buddha recognized and taught that the root of all our suffering is poisons in our mind, our conceptual mistakes and emotional habits. The one that was triggered when my dream business was shut down, attachment, remained ready to poison me again when I retired, as I’ll explain in a minute. Another poison is anger. I was lucky that was not a problem for me. My father was a pacifist from a family of them and I inherited their abhorrence of violence. That was what made me think my goal should be wisdom. The utter madness of WW1 had ended only 26 years before I was born, I was conceived at the height of WW2, and nuclear WW3 was imminent when I was in High School. What could be more important than seeing how to bring an end to that violence? Jealousy, another of the most destructive poisons, didn’t seem to be much of a problem for me because my parents had none but as I will also explain in a minute it was in fact a huge obstacle. The worst obstacles are those we don’t even see. I was blessed that the poison of pride was not much of a problem. My parents paid no attention to what others might think of them. They had strongly held values to guide their own behavior and they did not have the habit of condemning others. Actually, the longer I live the more blessed I realize I am by my mother who died worn out when she was 59 and I was 23. She grew up with two younger sisters in a Catholic orphanage, trained as a children’s nurse and was utterly convinced that if there was a problem, she could fix it. She gave me confidence. As I grew older I began to think back over my life. I had sometimes noticed myself acting selfishly but it was only after I retired from years of too long days of obsessive work that I recognized my self-absorption. It took even longer to see the origin of that selfishness. My mom loved children. She had no more of her own after me but when I was 6 or 7 they got me a foster brother. I never acknowledged him and remember almost nothing about him. At some point my parents and the social worker decided to send him back to an orphanage. The explanation I remember is that he didn’t fit in. Later, I got a foster sister who became a great disappointment to my mom. I had even less to do with her. She ran away forever when she was around 16. I was so ashamed when I finally recognized how I had treated my siblings. At last I realized how self involved I was. My behavior was poisoned by jealousy and what is translated from Buddhist texts as ignorance, which means being unaware and uncaring. A little later I had my next great encounter with a broken dream. Reflecting on that I finally began to recognize that I was also poisoned by attachment. The upside of the acquisition that ended my network business was enough profit from stock options to buy a run down farm. I wanted to recreate my early childhood world. We raised sheep for a few years but my jobs left me too little time for farming. I dreamed that when I retired I would learn to make excellent hay. By the time I stopped spending twelve hours a day in my office two hours away from home as well as many weeks overseas on business, Felicity had decided she must fulfill her own lifelong dream and live by the ocean. So now I was powerfully attached to two incompatible things, Felicity and the farm. Abandoning the farm was what finally showed me that source of my suffering, attachment. So, having at last recognized that my mind was poisoned by attachment, jealousy and ignorance I was very ready when I finally stumbled upon the results of Buddhist training. Trekking in Nepal I met people whose culture was cheerful and kind, which I thought must result from Buddhism. I began seeking a teacher. Felicity met one while I was away in Nepal, Anam Thubten, whose presence and way of being was an extraordinary inspiration. He exemplifies the kindness I’m aiming for but I needed more instruction on how to proceed. I meditated intensively for days and weeks at Zen Mountain Monastery whose exceptionally wise abbot, Shugen Sensei, told us the central truth: “If you really want to end suffering it’s very simple. Just stop creating it.” I didn’t know how to meditate though. 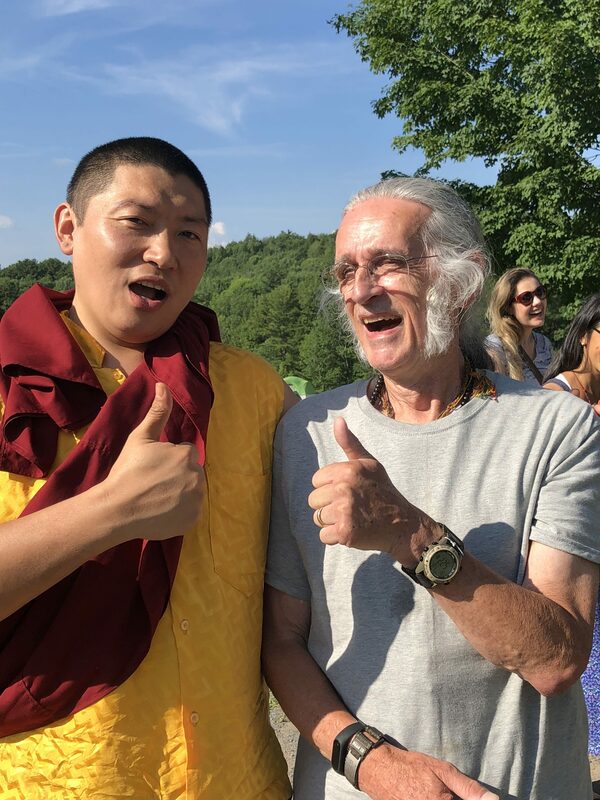 Then I met Phakchok Rinpoche and I knew instantly that I must do what he said. I had always rejected authority but this felt entirely different. Rinpoche knew what I must do and he would tell me. I don’t know how I knew that. It was such a blessing. At that time I had made a little progress on attachment and recognized my most devastating poison, ignorance, along with the jealousy that triggered it, so I was well positioned for training in how to dispel them. I was also well prepared to gain equanimity because I had always been fairly calm. My mom had given me deep confidence. What all this experience has taught me is, it’s extremely difficult to recognize, much less overcome our mind poisoning habits without a training program. I didn’t learn much until after I found one, mostly just created suffering that prepared me to respond. If we want to change we must find a program that feels appropriate for us then follow it diligently, not worrying about whether it will actually work. So ALS turns out also to be a blessing because it makes it much harder to pretend I’m not going to die. It’s easier for me to keep in mind that my life will end soon. It’s also easier to accept that although I can’t, in this body, end all the suffering in the world, it’s enough to do what good I can while I’m here. I can spread some kindness. Thank you for this very lovely essay. I am enriched by having read it. May all the peace, love, and wisdom you seek be available to you. Thank you Martin for sharing this powerful and inspiring piece. It is especially poignant for me to read your reflections on your outward journey, as I have known you and witnessed much of it for over 46 years. So it is a gift that you are sharing your inward journey in the spirit of true kindness. Thank you for sharing. You have done well with your life. I think you already know where I am coming from, if you read the last chapter of my last Sidwell book. Martin, all I can say is WOW. Very nicely said. This summer I, too, discovered how “obstacles” on the path are actually blessings. They really light up and intensify our practice and all of the beautiful qualities of our nature. It’s just the right amount of pressure to make the stone really sparkle. Thank you also for reminding me of that quote for retreat – “You’re not training to be a buddhist. You are training to be a buddha.” I remember this one, but I can’t remember who said it to us. What an excellent reminder. It is such a treasure and a joy to read your blog, Martin. From the bottom of my heart, thank you. Shu-chin Wu was the one who said that.